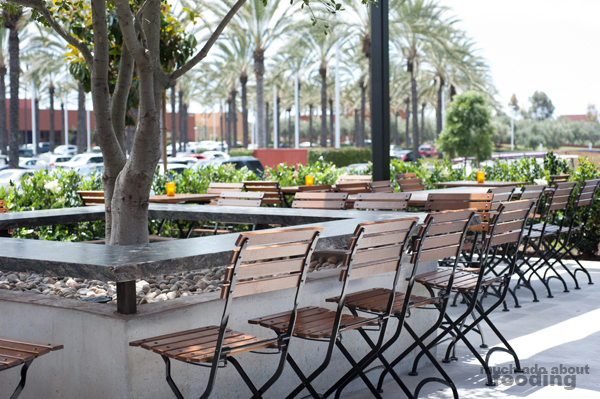 June 8th welcomed the newest addition to the TAPS Fish House & Brewery family - a location in Irvine! 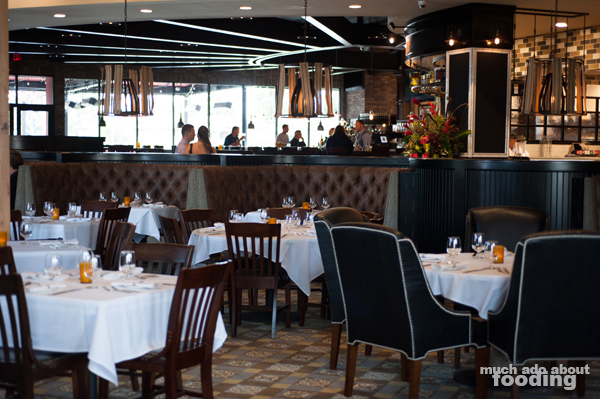 Situated in The Market Place, the restaurant boasts 10,000 ft² of space in furnishings atypical of the other locations. Instead of being heavily bricked, TAPS Fish House & Brewery in Irvine features darker tones and use of distressed wood to portray a more South County appropriate atmosphere. Nevertheless, the offerings remain very similar and the emphasis on their excellent seafood and housemade charcuterie has stayed. We stopped in prior to the grand opening to preview the space, and there was much to catch one's eye. Upon first entrance, you will find a wine cellar enclosed in glass for your viewing pleasure before coming into the main dining room with its raised ceilings and dark shades. A vintage, tufted feel is the best way for me to describe what the main booths and dining tables were composed of, and the open sectioned areas titled with serifed names felt much like a high-class market with fare ready for the taking. Outside, the patio was fairly expansive as well and the tables spread apart far enough to allow for their tableside service items to roll to. It certainly has a different appeal from the Corona and Brea locations in terms of interior design. They also feature a bar with 14 of their brews on tap along with 10 other beers, draft cocktails, and wines. Those interested in wine lockers have the option of purchasing annual commitments as well. 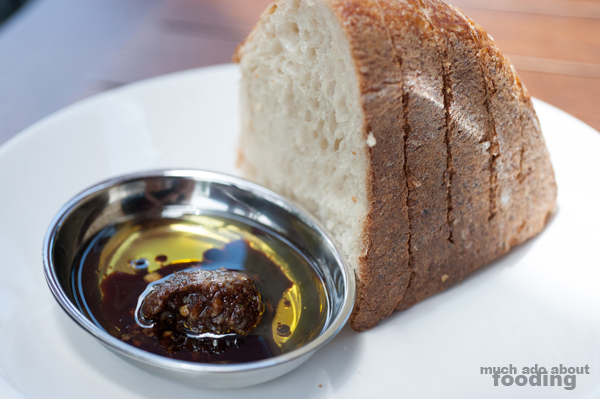 We started off with their typical bread and signature garlicky balsamic and olive oil dip which is not for the feint of heart when it comes to garlic. Don't expect to finish the day without the garlic smell heavy on your breath. Our first appetizer was the Calamari Fritti ($13.99 - flash-fried wth fennel, lemon, and a charred tomato aioli) which came with paperthin lemon slices also battered and fried, giving a bright zest to the dish every once in a while. 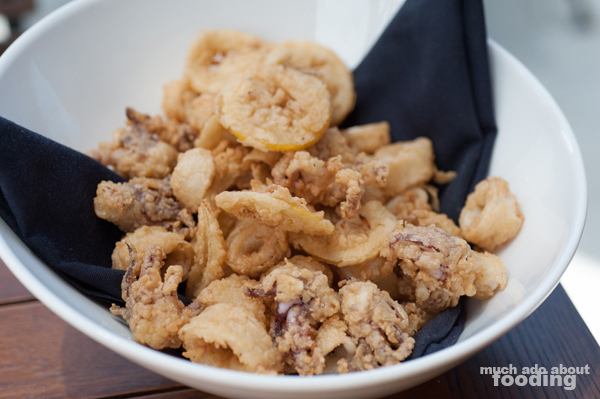 The batter was crunchy and well-balanced, and the calamari had an al dente texture we enjoyed. 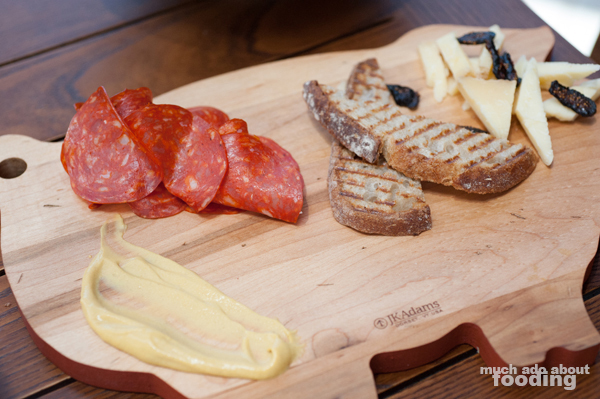 Next was a meat and cheese board of their Dona Juana Aged Chorizo ($3.99 - Spain) and Fiscalini Cheddar ($3.99) with some dried figs. Their meats and cheese range from $3.99 to $5.99 and can be fixed up as you like. Both was excellent on their own but I would not personally pair the two together. The entrees consisted of the Seared Yellowfin Tuna Salad ($21.99 - mixed baby greens, chicories, green onions, cilantro, red bell peppers, and red onion in a honey miso vinaigrette) and the Jerome & Jose's Jambalaya ($17.99 - shrimp, chicken, Andouille sausage, smoked ham, tomato cayenne broth, and dirty rice). 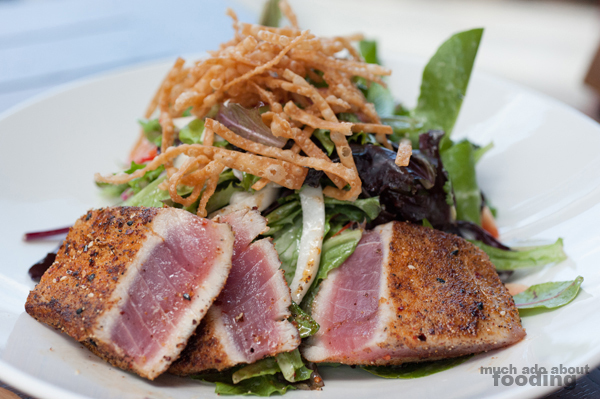 The tuna on the salad was a perfect sear with the right amount of warmth and rawness in the center; as an overall dish, this was stellar when we had it. The seasoning on the seared side was balanced between slightly spiced and salty, and the brightness of the salad with its light dressing provided the right amount of acid to the overall plate. Even the fried wonton crisps on top were a good textural touch. 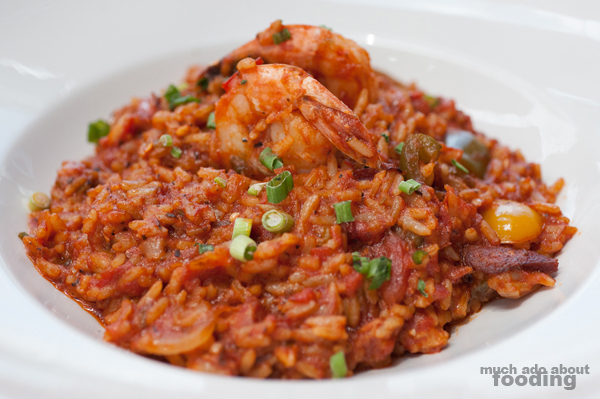 As for the jambalaya, however, we were disappointed at how little meat there was in it considering its listing. There were just two (overcooked) shrimp on top and very little of the chicken, sausage, or ham present. Perhaps we had the wrong scoops but it came out more like a tomato rice than a jambalaya. Seafood at a fish house would seem to make the most sense, it seems. 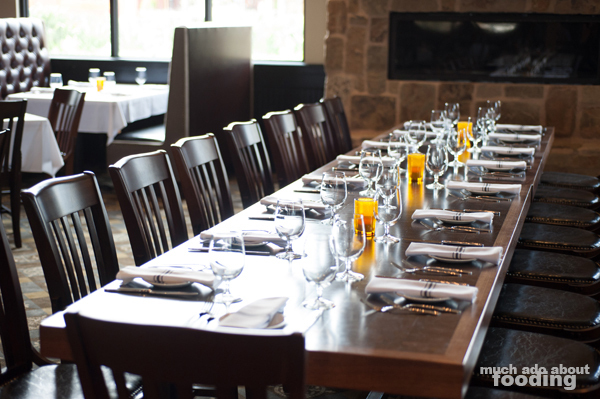 One of the features of the Irvine location is their tableside service items which can encompass all parts of the menu from appetizers to desserts. We saw some people getting salads mixed in right next to them, dishes being sauteed on portable burners, and desserts finished by the guests. 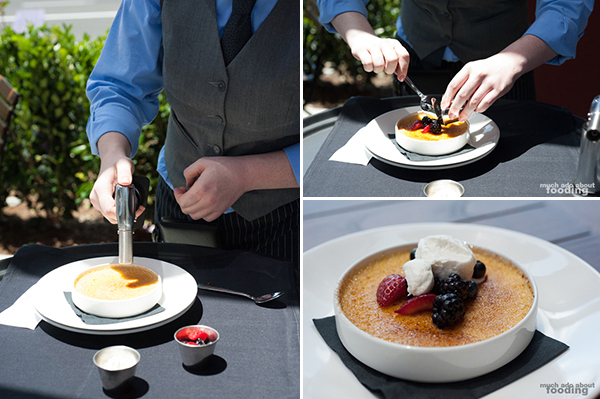 Our Creme Brulee to end was one of those - the sugar was burned in front of us before being topped with berries and cream. I can see the entertainment value in liquid nitrogen ice cream tableside but not every single dessert needed to be done this way. The creme brulee was a great finish to the meal but did not need the extra flourish. Hopefully this does not become an issue when there are hundreds of guests in the restaurant! Congratulations to the TAPS crew for getting their South County location after several years of planning on one. Find their newest location at 13390 Jamboree Rd. 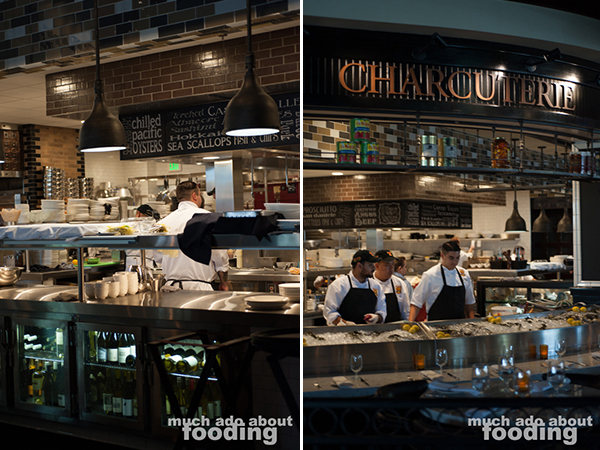 at The Market Place in Irvine, California, 92602 and get ahold of their award-winning seafood. We also recommend their indulgent brunch buffet as well because the dishes are top-notch there!